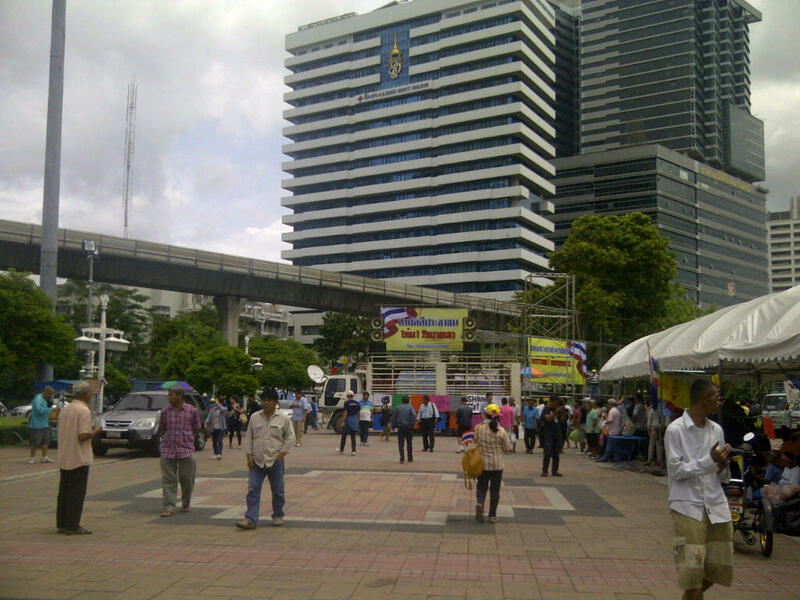 On Sunday, August 4, the anti-Thaksin People’s Army, gathered outside of Lumpini Park to protest against the Government. The crowd started late in the morning and ended with about 1,100 people at the popular park in Bangkok. Many sought the abolishment of the Government and demanded the army to intervene as similar to the 2006 coup, that removed democratically elected Prime Minister Thaksin Shinawatra. The People’s Army consist of neo fascist movements such as Pitak Siam, Thai Patriots Network, communists, V for Thailand and many members of the Democrat Party. This entry was posted in News, Thailand and tagged Bangkok, breaking news, democracy, democrat party, government, liberty, Lumpini Park, military coup, People's Alliance for Democracy, People's Army, Thailand, V for Thailand. Bookmark the permalink.